I've always loved rulers and yardsticks, though I'm not quite sure why. Back in the day, my dad and I even made a vintage yardstick covered table desk that is still in use in their house to this day. These days I've got a lot more tool experience under my belt and now I'm making wood things all on my own. 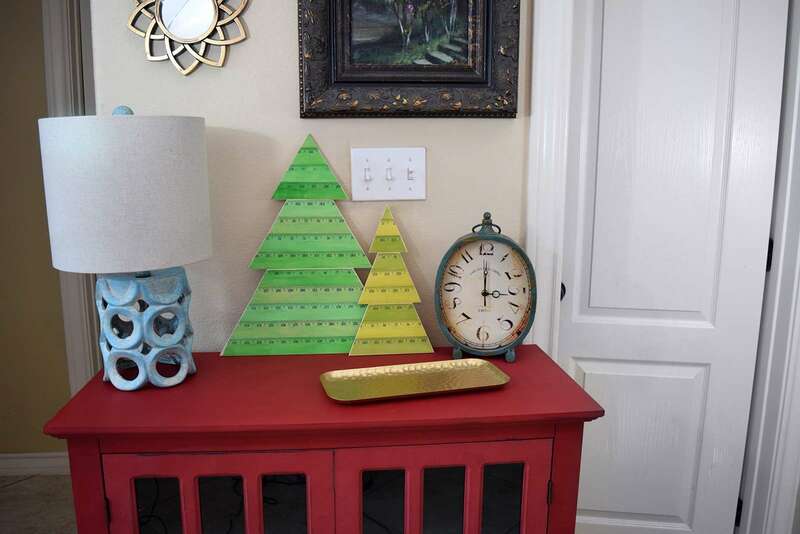 And with the holidays quickly approaching and a house full of Christmas-less decor walls and tabletops I'm setting out to DIY as much holiday cheer as I can! Why not toss my love for all wood things that can measure, too? 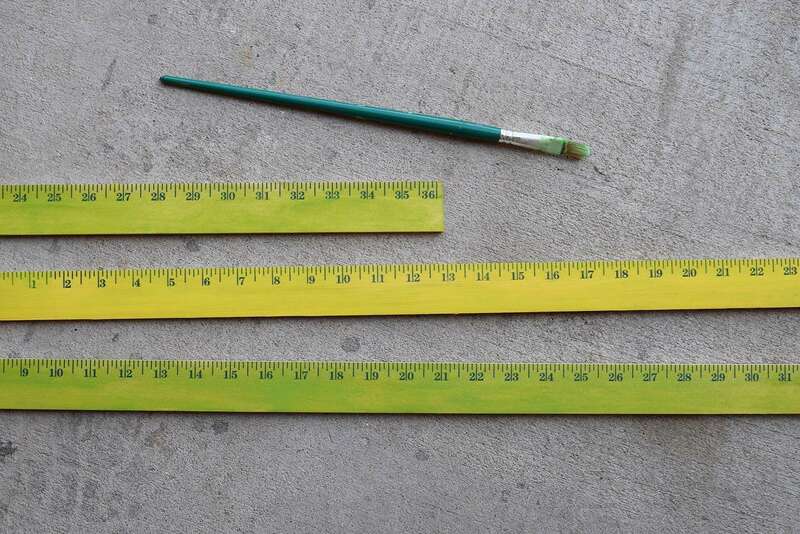 Back in the day I used a lot of vintage yardsticks for projects but they can get so pricey. It's not uncommon to see vintage sticks sell for around $7 apiece on eBay. 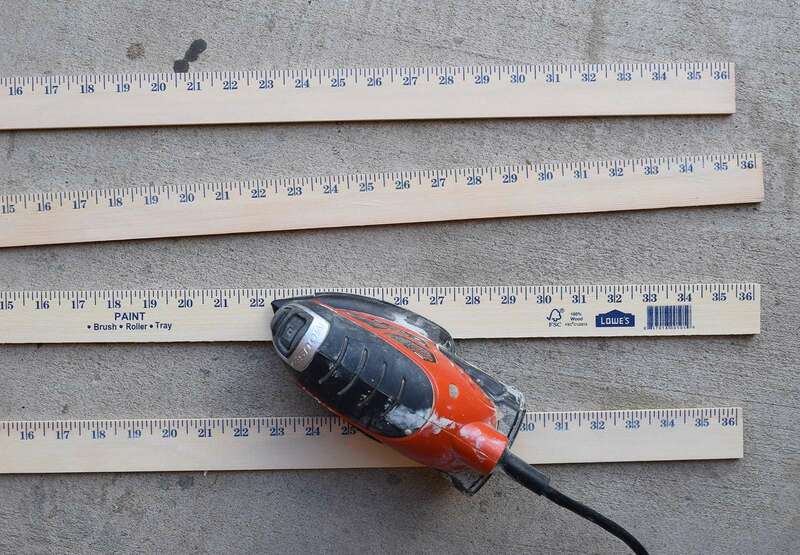 To keep this project budget friendly I purchased a handful of wooden yardsticks from my local Lowe's. Here the hash marks are blue like the store's logo. You can also get sticks with orange marks from Home Depot. My first choice was to run to Ace Hardware to get sticks with red marks to go along with my green paint job but they were closed on that day and so blue it was! Keep an eye out at local hardware stores for other colors. You can purchase a whole bunch of colors for a more, well, colorful look! To remove logos and unwanted words use a small power sander to carefully sand them away. When looking through the barrel at the store grab up sticks that the marks feel fairly flush. If the marks are very deep you'll need to sand much further down and change the shape of the stick from flat to angled toward the bottom. 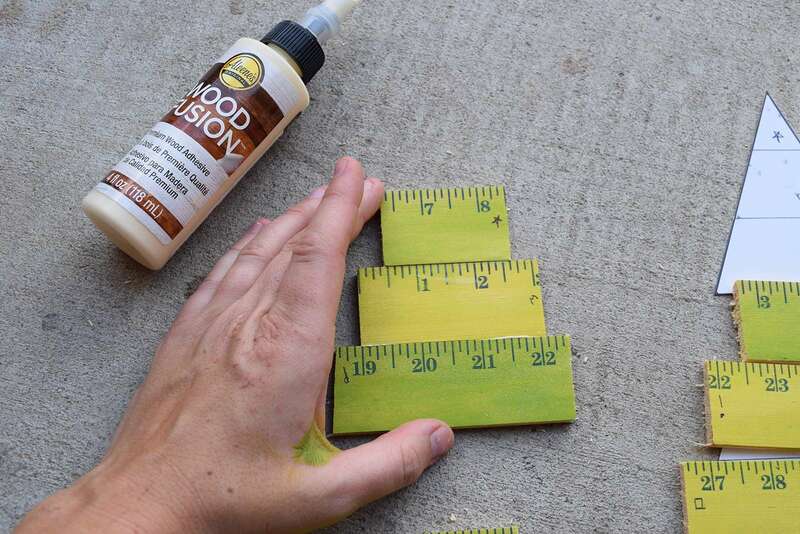 Hit your cleaned up yardsticks with watered down paints in various shades of green. 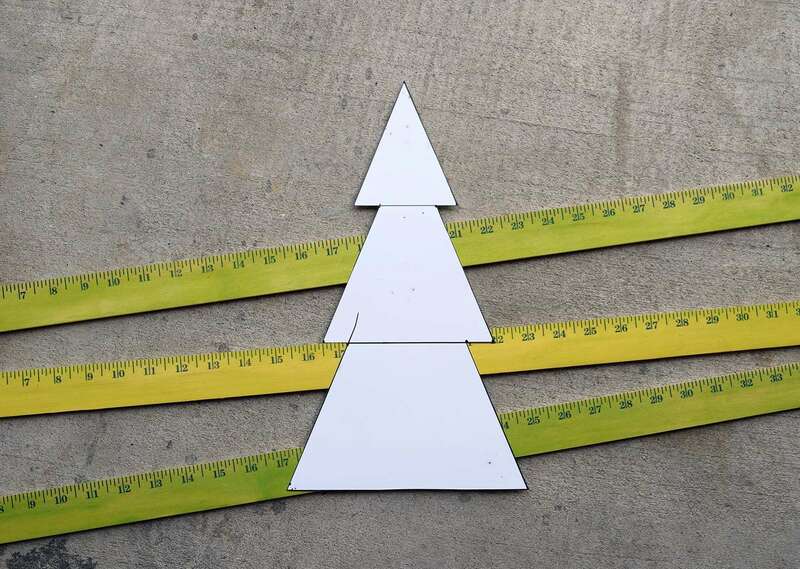 Now I technically used 3 yardsticks for my smaller and 4 for my larger Christmas trees but that was largely because I made them on different days and couldn't find what I had left from my first go. You can easily make both of these sized trees out of 5, maybe 6, sticks if you pay close attention and do your cuts right the first time. 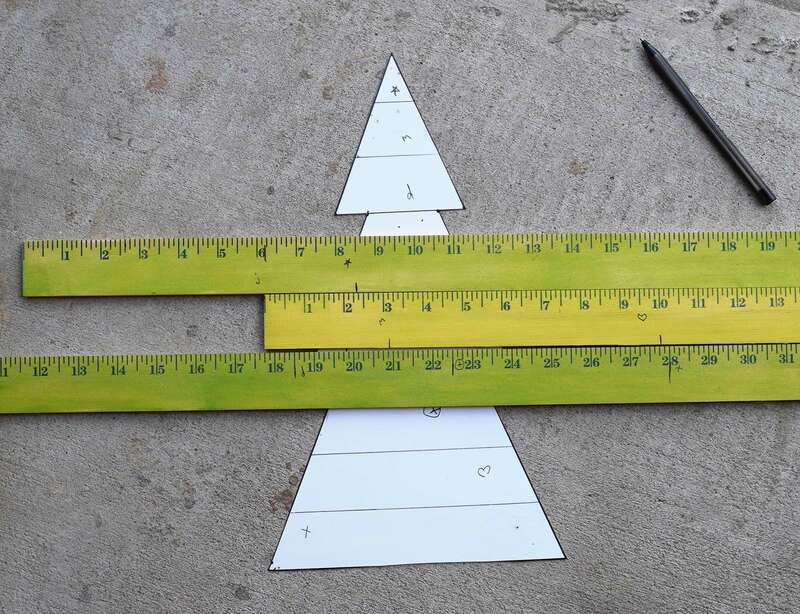 That makes this project crazy affordable since yardsticks are about $0.99 apiece. Now we need a pattern to work by. 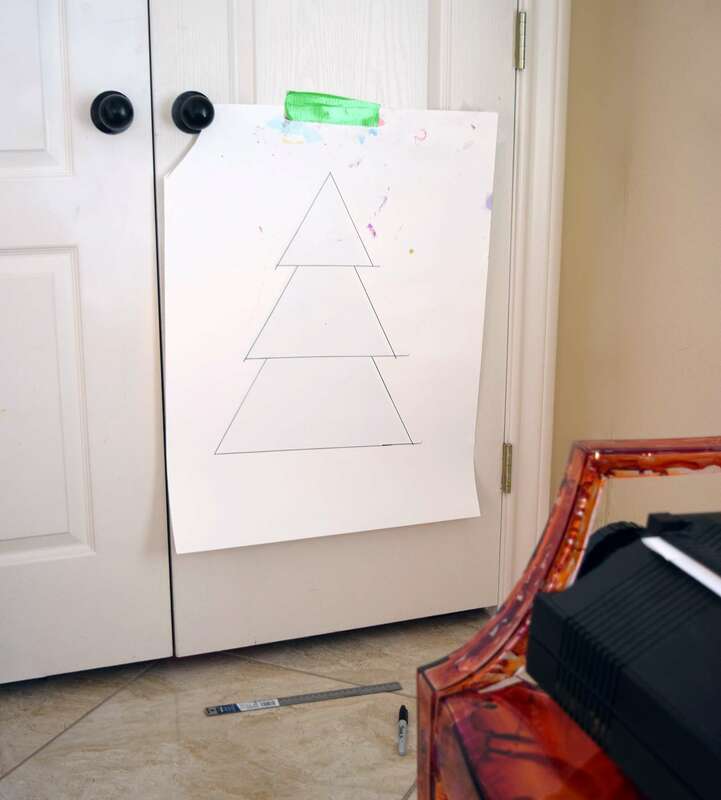 You might be better at drawing things symmetrically than I am so this step might be so much easier for you than it was for me... We're basically going to make a large pattern to make our Christmas tree out of using poster board. In my case I'm using old poster board that has gotten messed up and was destined for the garbage bin. 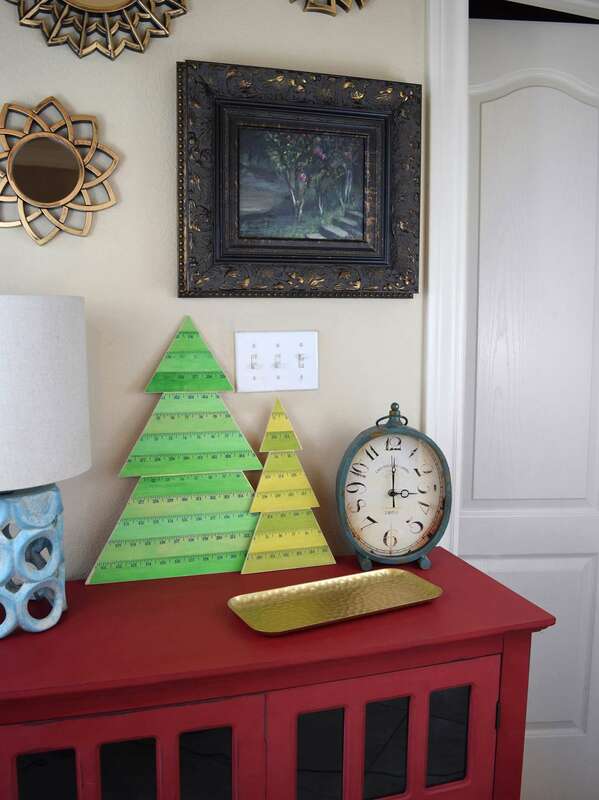 If you can, using a ruler draw a tree shape onto your large piece of paper. 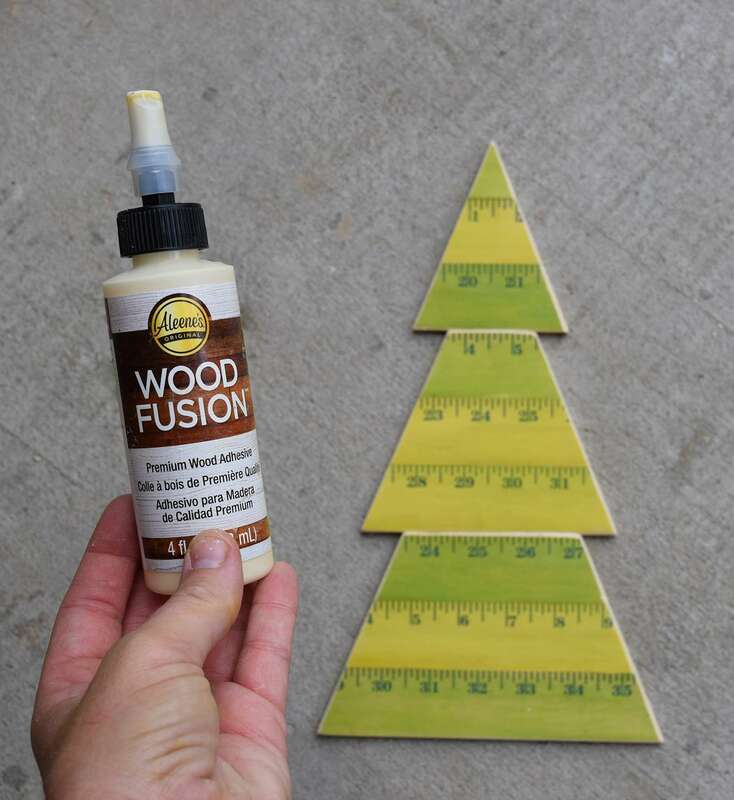 Be sure to make this pattern the exact size you want your finished wooden yardstick Christmas tree. If, like me, things tend to go wrong when trying to draft things up, you can also print the pattern above and use a projector to beam it onto your paper and trace it on. You can purchase a cheap projector with a discount coupon at craft stores or you can borrow one for free from lots of libraries. Cut your pattern out with a pair of scissors. Again, I used poster board because I had it available and because it holds its shape well as a pattern. It's not too floppy but not too stiff to easily cut out, either. Now we are going to find out where we need to make cuts on the yardsticks to create the tree shape. 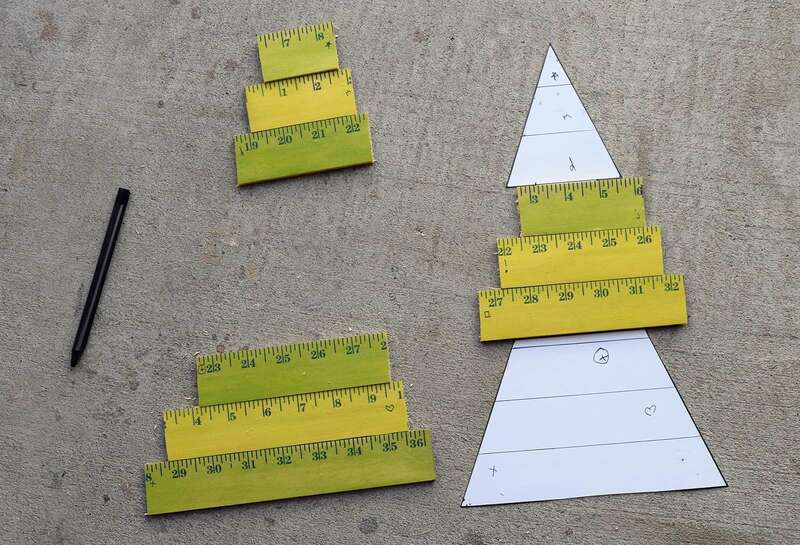 Starting at the bottom, and working your way up to the top of the tree shape, stack the yardsticks and make marks on the left and right, giving about a quarter of an inch of wiggle room on each side, for the longest edge. Make corresponding marks on your pattern and the back of your yardstick. You can also make a mark right by your cut lines so you have a mark on the front, as well. Just be sure to keep it out of the way so that once you trim the sticks the mark will be trimmed away. 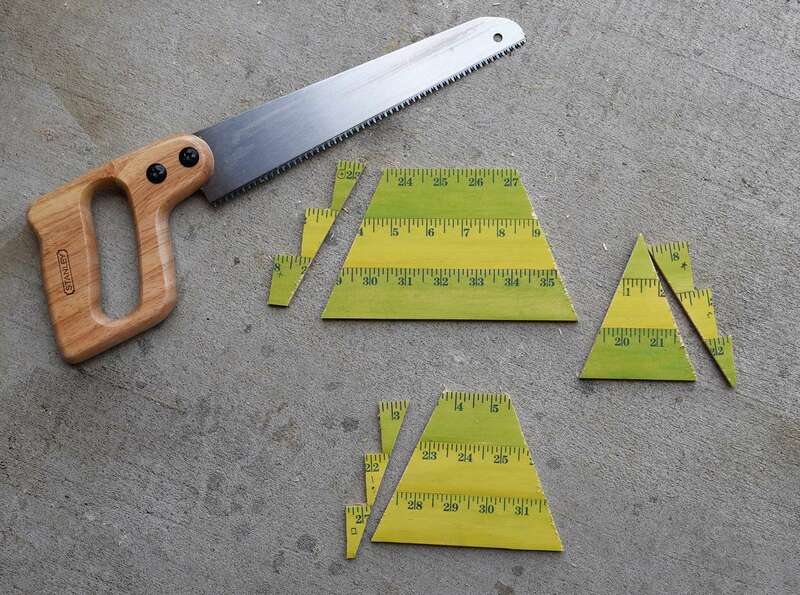 Using a handheld saw quickly cut the pieces to the correct length and stack to make sure that the pieces overlap the pattern. We'll be working in sections of the tree from top, middle and bottom. Keep these sections together. 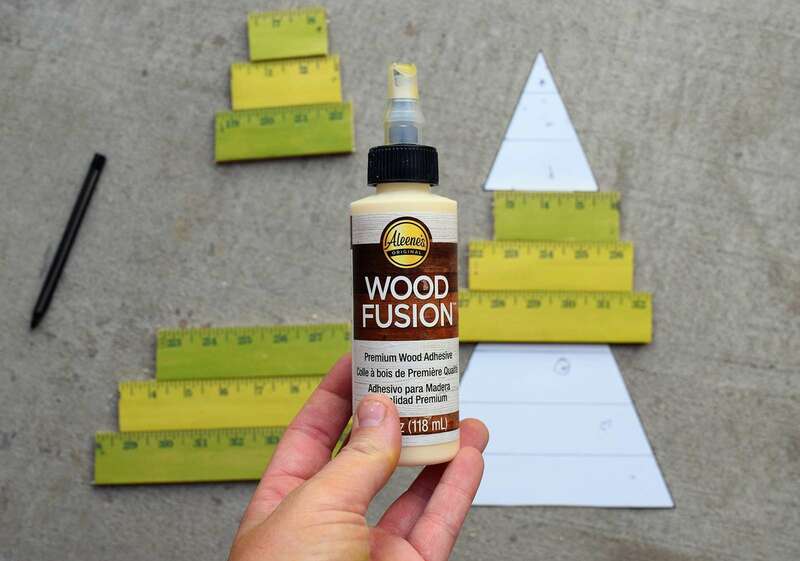 This is where we'll first use our Aleene's Wood Fusion glue (which I love, by the way). It dries super fast and I love the long, straight applicator tip. Continue gluing the pieces together until you have your three sections together. Press the pieces together so they really stick and then wipe the excess glue away with your finger. Place on a flat surface to dry, at least an hour. Now this is why I LOVED this glue so much. 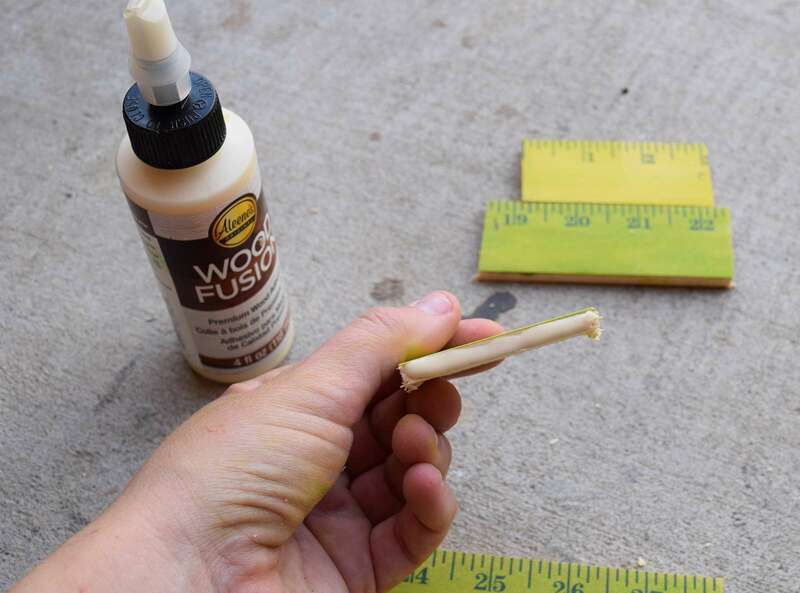 One our, outside in the summer heat and this glue was SET. Boom! 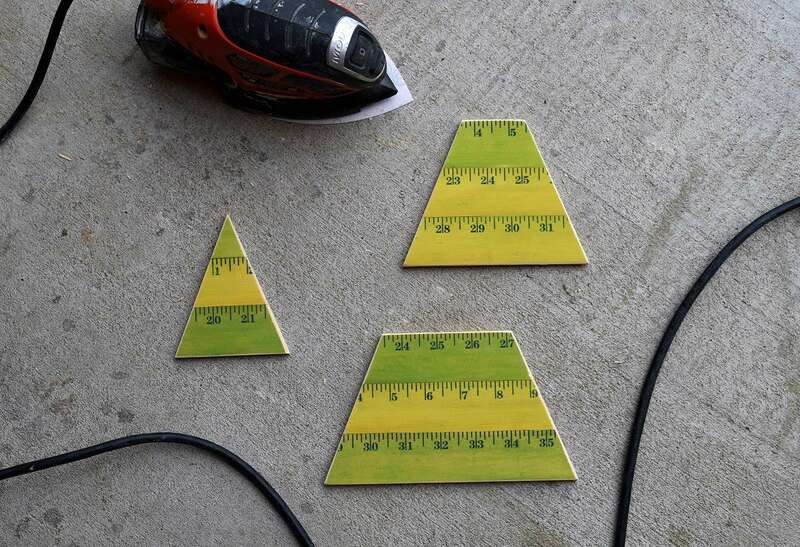 Once the glue is dry use your pattern to trace the triangular shape onto the back of each corresponding section. Use a fine tooth saw to trim away the excess wood along that line. You can also use a power mitre saw if you have one. Using your power sander smooth off the edges from your cuts and then, if you'd like, slightly sand away the color and hash marks off of the very edges. This will help to define each section once the piece is glued together and it's a look I really dig, but it's totally optional. 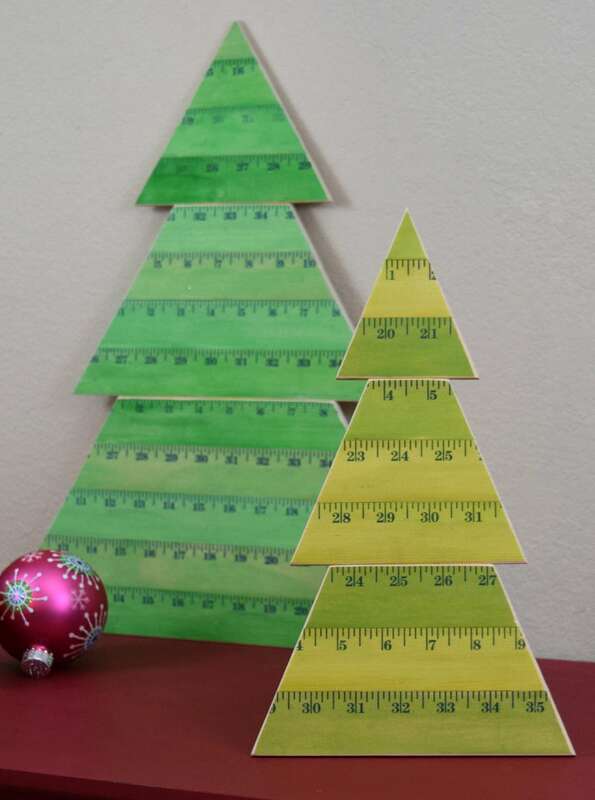 Apply glue to each section and stick the tree together. Place on a flat surface and allow to dry. Now we aren't using any kind of backing support pieces or staples to hold this together, as I often do for wood projects. 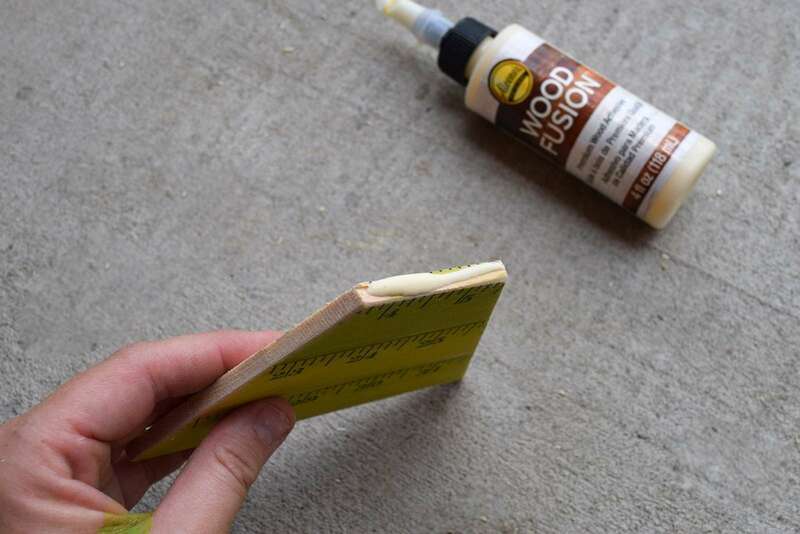 Simply put this glue is strong enough and this project is not going to be taking a lot of pressure so it just isn't necessary. Just give the piece a few hours for the glue to get a good cure to it and you're set. 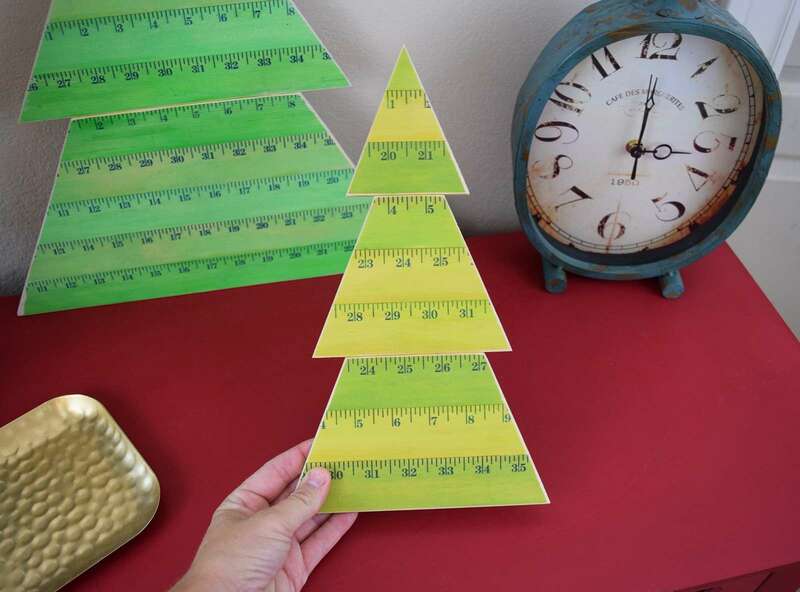 I made 2 trees with my 7 (but should have been only 4 or 5) yardsticks. One of them stands 19 inches and the other 13 and the complement each other with their different sizes and varying shades of green. Set together on top of my bright red cabinet these guys look incredibly festive and they didn't break the bank. I'm kind of toying with the idea of making these guys with plain lumber and adding twinkle lights for a different kind of a look, but for now I love the kind of kitschy look I'm getting from all of my yardsticks! You don't need any power tools to make these and it's a great introductory project for woodworking, which is a highly satisfying craft! Happy Holidays!